SoundTap Professional Audio Recorder lets you record just about any audio that plays through your Windows computer including streaming radio, VoIP calls and Instant Messaging conversations. Simply install this software, turn it on and then all sound played on or through the PC will be recorded as wav or mp3 files. All audio is 'tapped' by a virtual driver directly within the kernel so the process is perfect digital quality. 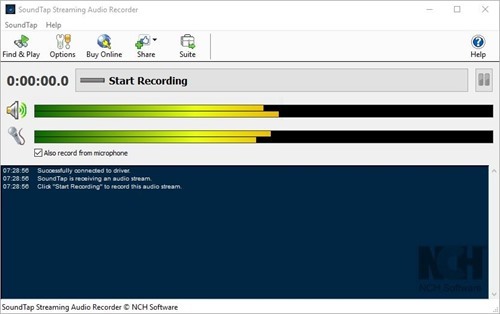 SoundTap Streaming Audio Recorder Pro features: * Records any sound you can play on your PC. * Lets you listen as you record (optional). * Records what is being input into the PC at the same time (optional). This is useful for recording voip calls. * Directly links to the WavePad Sound Editor Software so you can edit the files you have recorded. * Directly links to the Switch Mp3 File Converter Software so you can convert the files from mp3 to over 20 other file formats if you need it in another format. * Directly links to the Express Burn CD Burner Software to record to CD.